Cholesterol is a substance that is produced in the liver, and it is often affected by a high intake of saturated fats. It is found in every bodily cell and is vital for cell function, but too much can lead to serious implications. When a patient receives a routine checkup, doctors check their bad LDL cholesterol and good HDL cholesterol. LDL stands for low-density lipoprotein, which is the main carrier particle for cholesterol. High levels of LDL cholesterol are linked to atherosclerosis, heart disease, stroke, and other serious health conditions. Small “bumps” form on the inner walls of the arteries when there is too much cholesterol in the blood, which over time narrows the arteries. 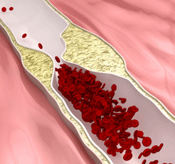 Eventually it can obstruct the blood flow, called atherosclerosis, and can lead to a heart attack or stroke. LDL should be below 100mg/dL. HDL is the good cholesterol and should be in the range of 60 mg/dL. Too little HDL—below 40 mg/dL—is a major factor for coronary heart disease. In today’s society, it is very common for people to take cholesterol-lowering medications. However, changing your diet may allow you to discontinue taking medications, as many Americans already have. The first step is to eliminate cholesterol from the diet, because the human body produces all the cholesterol it needs. Since cholesterol is only found in animal products, that means following a vegan diet. The second step is to reduce significant sources of saturated fat in the body, which is high in animal products and certain oils. Some processed foods contain trans fats, which also play a part in making one’s body produce more cholesterol. Another way to lower cholesterol is by increasing daily fiber intake. Soluble fiber slows the absorption of cholesterol and thereby reduces the amount of cholesterol the liver makes. Carrying excess weight can raise blood pressure and cholesterol levels, so it can also be helpful to lose weight when trying to lower LDL levels. Knowing that there is an easy and reachable solution for such a widespread problem should make it easier to adjust one’s lifestyle when dealing with cholesterol problems. Following a vegan or vegetarian diet will have a noticeable difference on LDL and HDL cholesterol in just a few weeks, and the previous health risks may rapidly diminish.